Sermon for Epiphany 4: "Blessed in Jesus"
The first word out of Jesus’ mouth in his sermon on the mount is a word of Good News: Blessed. This is a word of saving and redeeming, a word of blessing, or as we often hear it called: a beatitude. The first four beatitudes point to our life in Christ before God. The poor in spirit, the mourning, the meek, those who hunger and thirst for righteousness. What a strange way to start a sermon. Jesus doesn’t say blessed are the powerful, the strong, the happy, healthy, wealthy and wise. But rather…Blessed are the poor in spirit. What does it mean to be poor in spirit? It has nothing to do with what’s in our wallets. To be poor in spirit is to discover our own spiritual bankruptcy. As Luther once said, we are all beggars this is true. To be poor in spirit is to cry out, Lord, I believe; help my unbelief. Blessed are those who have nothing to offer God but our sin, our messed up lives, and our broken hearts. Blessed are those who look at the inventory of the commandments and come to the conclusion, “I have nothing.” Blessed are those who realize they haven’t kept a single commandment in thought, word, or deed not matter how good they might look to the world. Blessed are those who, join the tax collector in confessing, “Lord, be merciful to me, a sinner.” Or as St. Augustine once said, God gives into empty hands. This beatitude doesn’t seem like a blessing at first. Aren’t Christians supposed to be happy all the time? Aren’t we supposed to have the joy, joy, joy, joy down in our hearts? Aren’t we supposed to be living in the power of positive thinking so God will bless us? No, you won’t find any of that in the Bible. This second beatitude follows the first. We mourn the chaos of death in our world. We mourn that we live in a world where body parts of babies are sold and the elderly are encouraged to seek physician assisted suicide. We mourn the martyrdom of brothers and sisters in Christ. We mourn the lawlessness in our streets, but also the anarchy of sin in our hearts. Weeping may tarry for the night, but joy comes in the morning. Christ has died. Christ has risen. Christ will come again…for you and with eternal comfort. Once again Jesus’ beatitudes are the opposite of what we’d expect. He doesn’t say blessed are the strong and mighty. But blessed are the meek, the lowly, the humble. This runs against everything our old sinful nature loves: control and power and looking out for ourselves. Who of us can really say we’re meek? No…me neither. 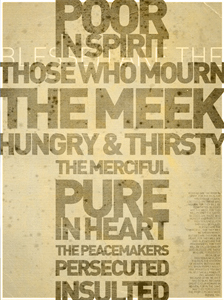 Now hopefully you begin to see that these beatitudes are about Jesus. Jesus is all of these for you; and gives them to you. Jesus is meek. Jesus loves his enemies – you and me and all sinners. Jesus turns the other cheek. Jesus lays down his life for the ungodly...for you Jesus humbles himself to the point of death on the cross for you. When Jesus is tempted by Satan in the wilderness he declares: Man shall not live by bread alone, but by every word that proceeds from the mouth of the Lord. We can do something about dry mouths and rumbling stomachs. But what about righteousness? We have no righteousness of our own. We can’t make ourselves holy. What we hunger and thirst for is found in Jesus: His Word is a fountain of life that slakes our thirst. His body and blood are bread from heaven that satisfies our hungry souls. The next four beatitudes turn us to our neighbor. Life before one another. Blessed are the merciful, the pure-hearted, the peacemakers, the persecuted. We reflect the merciful, pure-hearted, persecuted Prince of Peace who is their Savior and Lord. God gives us his mercy every Sunday in his Word, water, body and blood. We sing “Lord, have mercy” knowing that Jesus is mercy. And in this beatitude, Jesus calls us, who have received his mercy to be merciful to others. Jesus is the Light, we are a mirror called to reflect that light to others. We show mercy to one another when we forgive those who have wronged us; when we care peoples’ physical needs; and in countless ways in our daily callings in life. Here’s another difficult beatitude. Maybe you’re like me and you squirm a bit when you hear this. After all, Proverbs says, “Who can say, “I have made my heart pure; I am clean from my sin”? Can you? Can I? Not on our own that’s for sure. Out of our heart comes all sin - murder, hatred, envy, lust, pride, prejudice, lies. What we need is a new heart, a pure heart. Create in me, a clean heart O God, and renew a right spirit within me. Jesus takes our heart of stone and replaces it with a new heart whose life-blood is in the blood of the Lamb, a pure heart that beats in rhythm with God’s Word and promises. For many, peace is a political, emotional, or diplomatic word. The peace Jesus brings is different. It is the proclamation of Good News that in him the kingdom of God has come; that through his death and resurrection we are reconciled to God. Paul says a similar thing in Colossians: Jesus reconciles all things having made peace by his blood shed on the cross. That’s true peace, shalom. Sins forgiven. Blessed sons of God. On our own we not peacemakers. In our sinful flesh we’re all little revolutionaries seeking to overthrow the Prince of Peace. But in Christ, in your Baptism, by his blood shed for you; you are at peace with God, and called to declare that peace to others. That’s what Jesus sent out his disciples to do. Though sadly, wherever this message of Good News and reconciliation and peace in Jesus is proclaimed sooner or later, persecution follows. Blessed are you. You the disciple. You the baptized believer, child of God and heir of the kingdom. Blessed are you when others revile you, persecute you, slander you because you bear the name Christian. Blessed are those who are mocked and ridiculed by the “wise” of this world. Blessed are you when people laugh at you for believing in Christ, when people mock you for speaking the name of Jesus. We hear this and think…really? How is that a blessing? The persecution isn’t the blessing; it’s Jesus’ promise in the face of everything opposed to him that is the blessing. The kingdom is yours. Were they to take our house, Goods, honor, child, or spouse, Though life be wrenched away, They cannot win the day. The Kingdom’s ours forever. The beatitudes aren’t some checklist of things we must do to become God’s children, but who you are in Christ as God’s children. The beatitudes aren’t good news because we do them but because Jesus declares them to be true of us; because Jesus is and does all these things for you. The beatitudes are first and foremost about Jesus. He is the Blessed One from whom all blessings flow. He is the One who became poor in spirit, though He was rich. He is the One who mourned over our Sin. He is the meek One, who turned the other cheek, who gave His back to the whips of this world, who went as a Lamb to the slaughter. He hungered and thirsted for our righteousness, and in His hunger and thirst we are filled. He is the Merciful One, whose mercy knows no bounds. He is the pure-hearted One, innocent of all sin, whose heart overflows with love. He is the peacemaker, the One who made peace by his death on a cross. He is the persecuted One, who absorbed this world’s hatred and buried it in His death. All of this he did for you. Rejoice and be glad! You are blessed in Jesus, now and forever. Sermon for Epiphany 2: "Behold, the Lamb of God"
Ask most kids – or kids at heart – what one of their favorite parts of Christmas is and they’ll probably tell you something like this: giving and receiving gifts. But receiving it is only part of the joy. Look at it, shake it perhaps, and then open it in a flurry of paper, ribbons, and shredded tape. Whether it’s wearing those cozy pajamas, playing with the new Hot Wheels cars, or enjoying a game with family and friends - unwrapping a gift is also part of the joy. In the Christian Church we experience something similar, but with greater joy. At Christmas God sends us his only begotten Son, the very Word of God, wrapped in human flesh born for you. 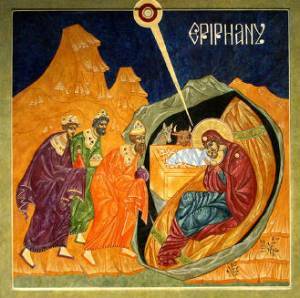 Epiphany unwraps and reveals the meaning of this gift. And who better to point us to Jesus than John the Baptist, the great forerunner of his birth who now heralds the beginning of his saving work for you. As John declares, in Epiphany, God reveals his gift to you, the Lamb of God who takes away your sin. An incomparable, incomprehensible, and gracious gift exchange – Jesus takes our unrighteousness, sin, and death, and, in exchange, gives us his righteousness, perfection, and life. And in the Scriptures, a Lamb means one thing: Sacrifice. Substitute. A life for a life. The innocent for the guilty. All of the Old Testament sacrifices and prophecies find their fulfillment in John’s words: Behold, the Lamb of God, who takes away the sin of the world! After the fall, the Lord God made for Adam and for his wife garments of skins and clothed them. How did God do this? The first sacrifice. A substitute. An animal gave its life to cover Adam and Eve’s shame and guilt. 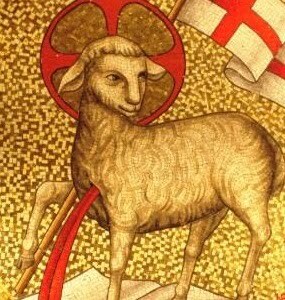 Some paintings in church history have even depicted a lamb as the animal whose life was given and blood was shed to clothe Adam and Eve. And though Isaac was spared, there was a sacrifice. God said to Abraham: “Take your son, your only son Isaac, whom you love, and go to the land of Moriah, and offer him there as a burnt offering on one of the mountains of which I shall tell you.” And as they’re heading up the mountain of sacrifice, Isaac says to Abraham, “Behold, the fire and the wood, but where is the lamb for a burnt offering?” Abraham said, “God will provide for himself the lamb for a burnt offering, my son.” And the Lord provided. The prophet Isaiah also helps us unwrap John’s words. The prophet proclaims a coming servant of the Lord who will carry our griefs and bear our burdens. John unwraps all of this for us as he declares: “Behold, the Lamb of God who takes away the sin of the world. If John the Baptist was a compass, his needle would always be pointing to Jesus Crucified for you. 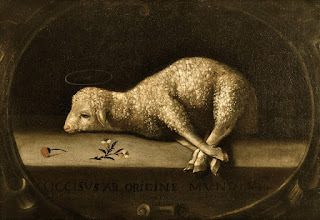 Behold, the Lamb of God whose sacrifice covers us from the guilt and shame of Adam. Behold, the Lamb of God, God’s Son, his only Son, the greater Isaac sacrificed for you. Behold the Passover Lamb of God whose blood sets you free. Behold, the Lamb of God who was pierced for our transgressions. And just like John, this too must be revealed to us, for we are blind in sin, ignorance, and the darkness of death. That’s why John says, “I did not know him”. The Holy Spirit had to reveal who the Messiah was for John, just as he does for you. For without the Holy Spirit our only desire is for us to increase and Jesus to decrease; our every thought word and deed is selfish, self-centered, and self-serving, as if we were the Messiah that John points to. Behold the sin of the world – yours and mine - that takes away the Lamb of God. This is the Lamb of God the Holy Spirit reveals to John. And the same Holy Spirit reveals Jesus to you. Behold, the Lamb of God who takes away your sin. And there’s only one way to take away sin. Blood. Jesus’ blood for your blood. Jesus’ life in place of your life under the Law of God. Jesus is judged in your place. He takes away sin by becoming Sin. He permits it to kill Him and He rises. And in His rising, He becomes the antidote, the medicine. His Blood, His life, for your blood and your life. Behold, the Lamb of God who takes away the sin of the world. Jesus is not simply the redeemer of the redeemable or the savior of the salvageable. He’s not the Lamb who takes away the sin of those who have the good sense to believe in Him. He takes away the sin of the world. No sin unaccounted for, no sinner left out. In Epiphany, God reveals his gift to you, the Lamb of God who takes away your sin. In Epiphany we receive God’s gifts. And in Epiphany we also give God’s gifts to others. The Holy Spirit’s work wasn’t done when John proclaimed Jesus to be the Lamb of God. Jesus invited Andrew: “Come and see”. And Andrew told Peter, his brother: “We have found the Messiah!” and brought him to Jesus. Jesus also invited Philip: “Follow me”. And Philip invited Nathanael to “Come and see”. Like Andrew and Philip, we tell others we know, “Come and see” Jesus, here for you in his Word; Come and see Jesus who washes away your sin in Holy Baptism; Come and see Jesus present for your forgiveness in the Lord’s Supper. You see, John’s words are also the church’s words. John’s confession is our confession. Today, Redeemer stands like John in a wilderness: a wilderness that devalues and dehumanizes life from womb to tomb; a wilderness full of creature comforts with little care for the unborn and indefensible, outcast, or homeless; a wilderness that mocks Christianity; a wilderness that revels in man’s increase and Jesus’ decrease. And so each of us a little “John the Baptizer”, pointing to Jesus and declaring to Huntington Beach, our friends, our co-workers, our neighbors, and everyone in need: “Behold, the Lamb of God who takes away your sin.” Each of you is like Andrew and Philip, called to tell your friends and neighbors, “Come and see Jesus”. Evangelism really is that easy. That’s what our preschool does for children and families. That’s why this congregation supports Vicar Toma and the work he is doing in our community and congregation. That’s what goes on daily in our music academy and Sunday School. That’s why we sing, hold Bible studies, countless activities, and strive to be faithful to our Lord in all we say and do in this congregation. In every other religion of the world, we offer sacrifices to God. Here, God offers His only Son. God provides the Lamb. Behold the Lamb of God, who takes away your sin. In every other religion of the world, man must seek and find God. Here, God seeks and finds you. Here God reveals his gift for you. The Lamb of God who takes away your sin. 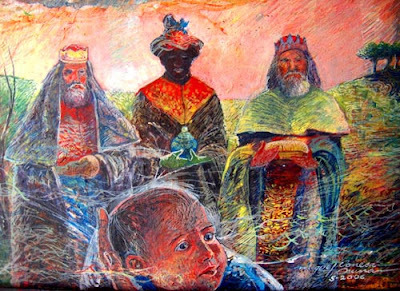 Sermon for The Epiphany of Our Lord: "An Epiphany Mystery"
There’s something intriguing, suspenseful, and enjoyable about a good mystery story. Whether it’s tracking the crook with Scooby Doo, Shaggy and the gang, reading Dorothy Sayers, Agatha Christie, Father Brown or Sherlock Holmes, watching NCIS, Law and Order, or CSI, or even playing Clue with family and friends…we love a good mystery. We want to know, whodunit!? Was it Colonel Mustard in the library with a candlestick or Miss Scarlett in the kitchen with a lead pipe? According to Paul in Ephesians 3, there’s an Epiphany mystery afoot. He even uses the Greek word mysterium (mystery) four times. The prophet Isaiah gives us a few clues. Arise, shine; for thy light is come, and the glory of the Lord is risen upon thee… And the Gentiles shall come to thy light, and kings to the brightness of thy rising. In the days of Herod the king, behold, there came wise men from the east to Jerusalem, saying, Where is he that is born King of the Jews? for we have seen his star in the east, and are come to worship him. In the Scripture’s way of speaking, a mystery isn’t so much a problem to be solved, but a hidden word and promise of God that He reveals. So, when St. Paul speaks of a mystery he’s speaking of a revelation, not of information but of the appearance person. Not a case to be closed, but more like a gift to be opened, revealed and received. According to Paul, in our Lord’s Epiphany, Jesus the Savior is revealed for all people. Jesus the Savior is revealed to you and for you. That’s what that little word “Epiphany” means; to reveal, appear, make known. The star revealed the birth of a king to the wise men. The prophet Micah revealed to Herod and the wise men that the Messiah (the Christ) was to be born, not in Jerusalem, but in Bethlehem. The magi’s gifts and worship reveal their faith in Jesus: Gold confesses Jesus to be a king; Frankincense confesses him to be God in human flesh; and myrrh confesses his death, for he came to be a sacrifice for you. And God’s dream sent to warn the wise men reveal Herod’s true wickedness. And just like the wise men, we are blind without God’s Word. As Isaiah reveals for us, the darkness of sin covers the earth. Thick darkness of death, doubt, despair, and wickedness shroud our hearts. Apart from God’s Word reveals, not only are we blind in sin we are blind to the true depth of our sin. Herod has nothing on our murderous, treacherous, two-faced sinful hearts. If we want to join the wise men in finding Christ, we must close our eyes to all that glitter in the world and find in this humble child our true and only treasure. Put away all selfish desires. Look to the concern of others and count our neighbor as more important than ourselves. In other words, to repent. And rejoice with the wise men in the revelation of the Epiphany mystery. To find in this holy Child the One who finds you and rescues you. In our Lord’s Epiphany, Jesus the Savior is revealed for all people. Jesus the Savior is revealed to you and for you. And like any good mystery story, our salvation happens in the most unexpected of ways with a most unexpected Savior. God becomes man and is born, not only as the King of the Jews, but the Gentiles as well. Jesus is born to lowly, unknown, humble people. The Almighty God and Lord of all is born of a Virgin and laid in a manger for all. Jesus’ birth reveals the kind of Savior he is: Jesus is born for the outsider, the foreigner, the outcast, lowly, losers, and sinners. Jesus is born for you. To demonstrate his mercy Jesus takes on all our misery. To reveal his grace Jesus bears our guilt. To make known his salvation Jesus becomes our sin. To manifest his deep love for you Jesus dies in your place. And not just for little sins and little sinners, but for the chief of sinners: the likes of Paul and you and me. We who were not God’s people are now his children. We who were dead in our trespasses and sin are made alive in Christ Jesus. We who were lost in sin, death and darkness have been found by the Divine Detective himself, Jesus Christ who is the Light of the world. In our Lord’s Epiphany, Jesus the Savior is revealed for all people. Jesus the Savior is revealed to you and for you.